Well, now I've got a little bit of time to myself, I thought I might cover the subject of moth trapping. For those of you who think moths are just little brown or white uninteresting flappy things, think again. In my (and several other people I know) opinion, moths are far much better than butterflies and there's only 52 species of butterfly in the UK. Whereas, there are 2500 species of moth! Now I know many of you are going to ask that infernal question of why do moths batter themselves silly round a light bulb at night and spend all day hiding in the dark? The answer, no-one knows! One of life's little mysteries I guess, but it's a mystery with a plus on it. At least with moths, you only have to switch a light on and they all come running (well, flying) unlike butterflies who you have to chase across your local park with a net looking like the local nutter! Well that's what the wife calls me when I do it and she makes sure to keep her distance from me in case anyone she knows might spot her with me. Now, I know what your thinking, you've googled up moth traps and looking at the price have thought, that's well out of my budget, and I agree with you. The cost of purpose made moth traps is disgusting, but have no fear. 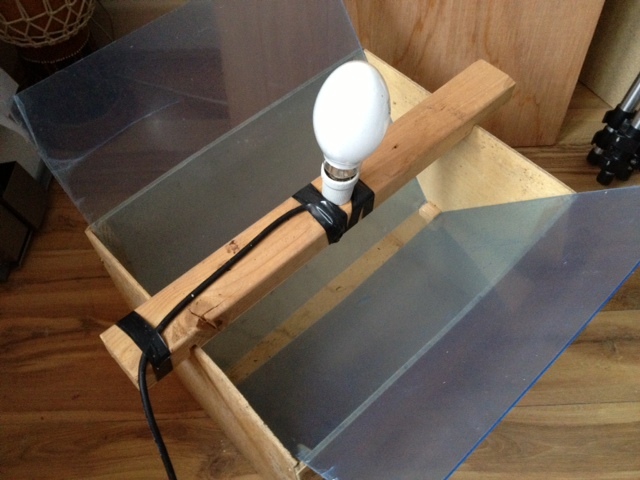 With some DIY knowhow you can make your very own Skinner moth trap like I did and hey presto, you're on your way to being a moth-er (although lepidopterist is the official term. Sad old git was also a something I heard someone say, but not sure that's an official term). Wood is a good start. I got some wood from an industrial estate, a company I was delivering too receive a lot of their goods in plywood packing crates. I saw that most of this was being broken up and put in the skip so asked the yard man if I could take some and explained what for, he happily agreed. 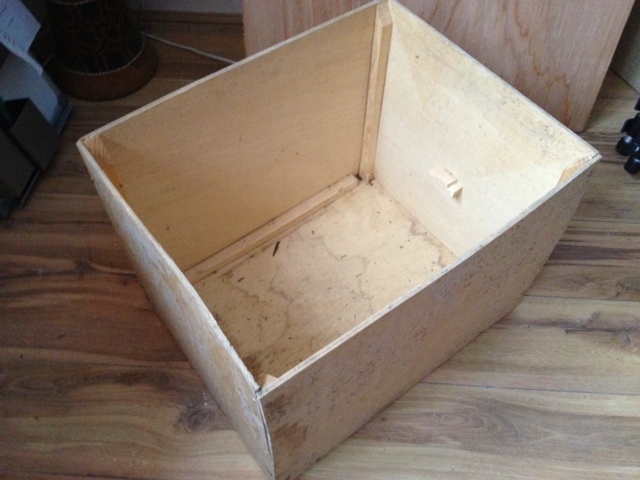 The box part of the trap needs to be about 18" high and about 2' long and about 18" across. But these measurements are by no means gospel, this is about the average size. I've seen traps a lot bigger than this, that needed to be put on castors to move it around it was so heavy. So you need enough plywood to do four sides and a bottom. If there are no companies get packing cased deliveries, you can always try your local household rubbish tip. The amount of useful stuff being taken to these places is astounding and I'm sure it wont be long before someone comes along with the stuff you need. Also keep an eye out for some clear sheets of perspex that will act as a funnel to guide your attracted moths into the bottom of the trap. From my experience with perspex, it's an absolute b*! *^* to cut, so it might be an idea to see if you can get hold of this first and then work around the dimensions of the perspex to save you cutting it. I know it looks a bit grubby, but it's seen some action you know. 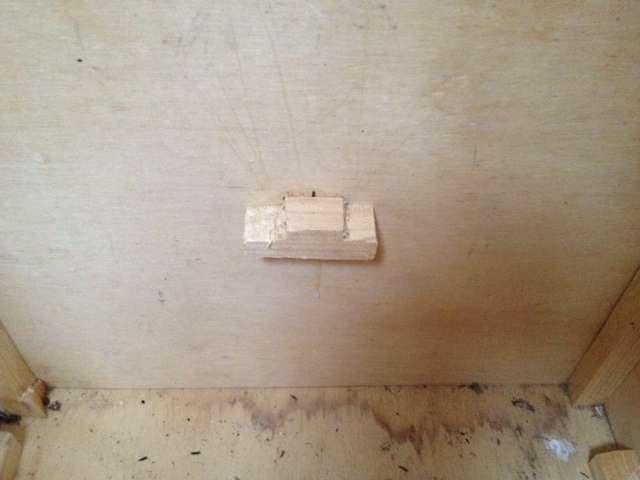 You will need to add some small blocks to each end of the box on the inside. 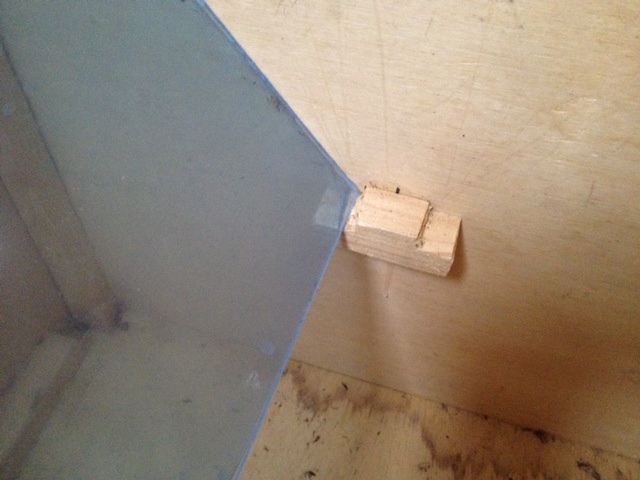 These are to hold the perspex in place and it needs to keep the bottom gap about an inch (25mm) apart to allow the moths to fall into the box. I cut mine from some battening using a hacksaw. No work of art, but it does the job! So you can see how it works. 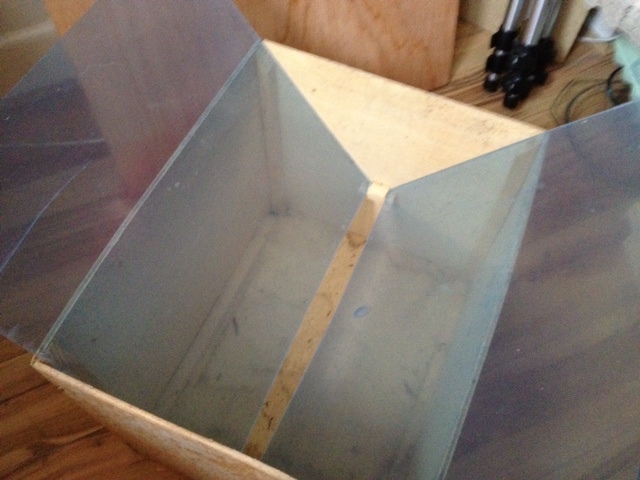 The perspex doesn't have to stick out so much at the top, but as I said previously, it's a b*! *^* to cut. So, that's the basics done, now we have to consider the electrics. There are two types of electrics that are used to attract moths, mercury vapour (MV) and actinic. I use a 125W mercury vapour bulb, which is supposed to be the most successful method, but requires it to be plugged into the mains, so is really only OK for home garden use unless you happen to have a generator. Actinic's are low voltage and can be powered by a 12v car battery, so they're portable, but not as successful as a MV bulb. Whatever you decide to use, I found this site to be useful and this is where I purchased my DIY kit. I say purchased, it was actually a Xmas pressie and it kept me busy during the cold winter months assembling it, which was quite easy as it came with instructions. BUT I MUST STRESS HERE, THAT IF YOU'RE NOT CONFIDENT WITH ELECTRICS, PLEASE SEEK SOMEONE WHO IS! I will not be held responsible for other peoples stupidity! Another IMPORTANT point to note here is that if you do choose to use MV, then use MUST use a ceramic bulb holder. 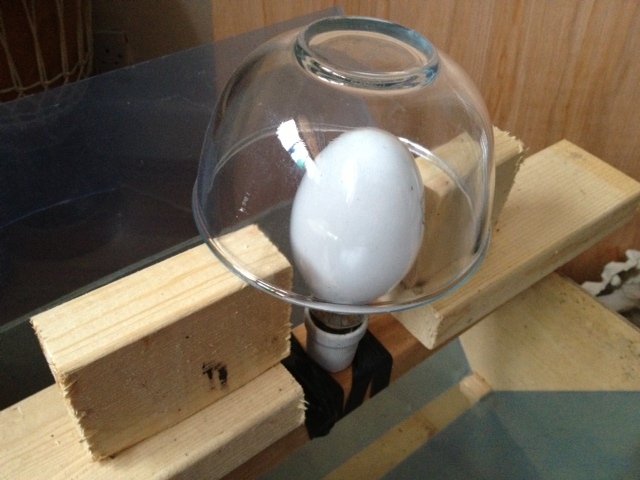 The MV bulb gets extremely hot and an ordinary bulb holder would melt exposing dangerous electrical parts! You have been warned. So here's a picture with the bulb attached to the baton that holds it in place. The black tape is just to hold the cable in place. Now, if I remember rightly, the electrical kit didn't come with any cable, so I suggest you buy some cable to your required length from your local hardware store. Weather proof cable used for ponds is ideal, remember, our weather guru's on the telly don't always get it right and you want to make sure everything's safe in the event of a sudden shower. I also have my choke unit (part of the electric kit) in a water proof box in case of such a shower. 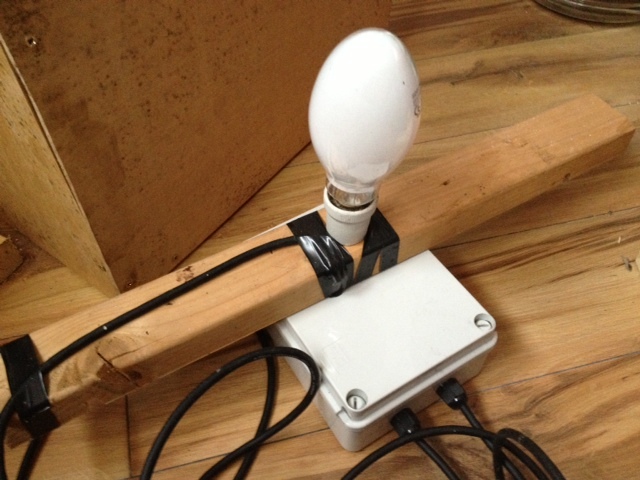 Light unit sitting on weather proof box. These weather proof boxes are also available from all good hardware stores. Not pretty, but it does the job! 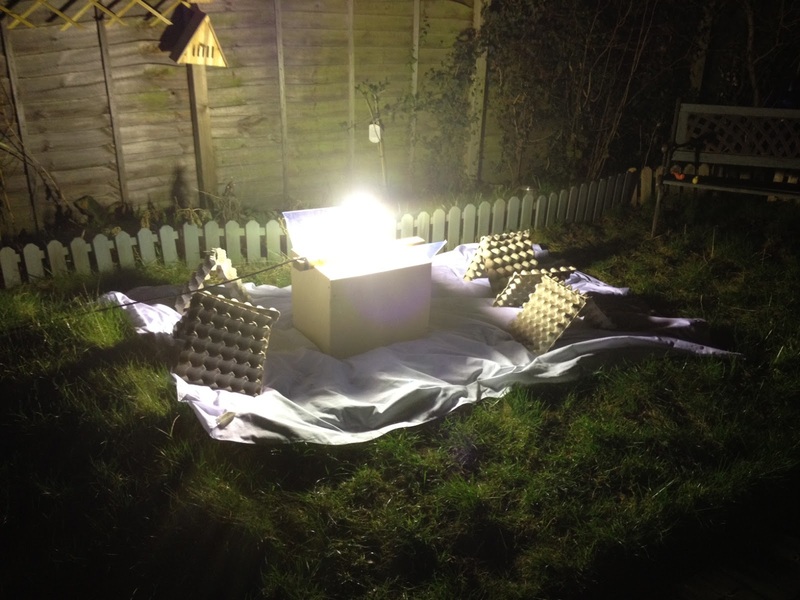 So, there's only one more thing you need for your moth trap, egg boxes. Yes, egg boxes. These provide comfy little cavities for your trapped moths to settle in once they've fallen into the trap. 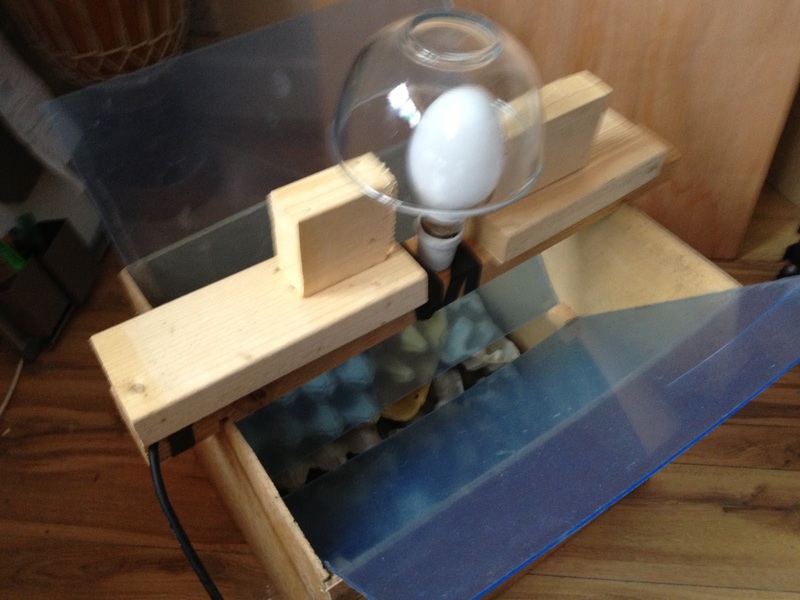 Add your egg boxes willy nilly to the bottom of the box like so. Finished and ready to go (apologies for the blurriness). So, here's a picture of it from last year up and running. Even from this photo, you can see the brightness of the light. You will also notice in the photo the trap is on a white bed sheet, this also helps to reflect the light and attract the moths. 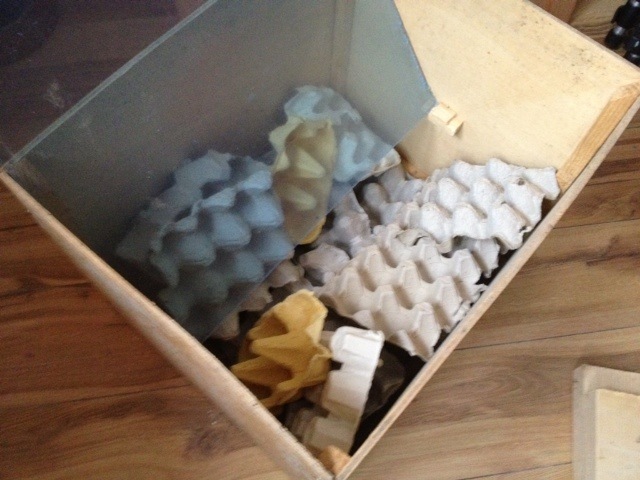 Also, you will see the larger egg trays (available from all good decent cafes for free), this also lets the moths that missed the trap find somewhere to settle and these are the first place I look when I come down to the trap in the morning. The UV doesn't only attract moths, you will also find other little creatures in your moth trap. These include caddis flies, cockchafers and other beetles, ichneumon's, bumblebees and hornets, butterflies and dragonflies are also to be found. I've also found the odd cat chasing moths around the trap as well as the odd toad making good use of it as an eat all you can restaurant. I've also heard reports of people sometimes finding the odd, fat and happy bat sitting at the bottom of a moth trap. Of course there is just one more thing you need for your moth trap and that is something by which to ID them by. I can suggest the following as being excellent books as it shows the moths at exactly the same size, it's almost as if you've lifted them off the page as you compare a live specimen to the picture int the book. and this book for the tiny little moths that you will get in your trap. The first book is for Macro moths which is a moth that has a wing span greater than 1cm. Below that, it's a Micro moth. I think that's enough for now to be getting on with, if you have any questions please message me below and I will do my very best to answer them. Interesting. I'll try it as soon as I can!